You know there’s one thing I really, REALLY love about being a blogger. It’s when you’re lucky enough to have a designer drop a package on you to preview. Those moments as you open the box and start to rezz the contents as you speculate what marvels await your earthly gaze. It’s a TANTALISING feeling, it really is. I was chuffed to receive a surprise from Ria Bazar Mavendorf today, and it floored me. As regular Kittywitchin’ readers are by now well aware, Ria’s one of my favourite creators, so I was in effect receiving a package from one of my virtual heroes! A rare privilege indeed. So because I’m already accustomed to Ria’s style, I wasn’t worried about the contents of the parcel, because I know that Ria is an excellent content creator, hence my returning to her store, and why I happily live in her Arizona House. Suffice to say as a customer I am confident in Ria’s designing capability, so I knew that whatever was hiding in the box would be a ‘wonderful thing’. 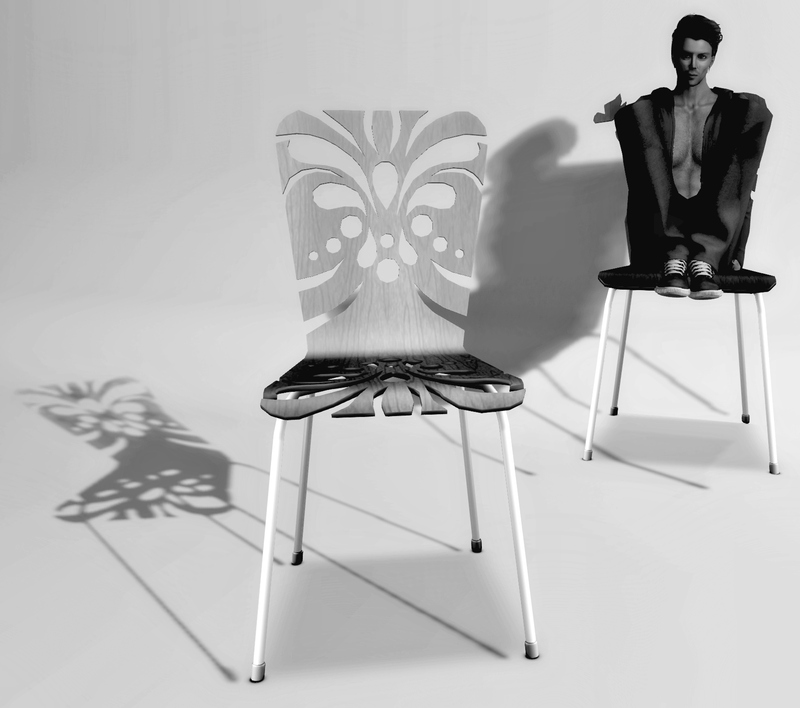 But of course what make these chairs far superior to the real thing are the cut-out designs within each one. They really are rather special indeed. 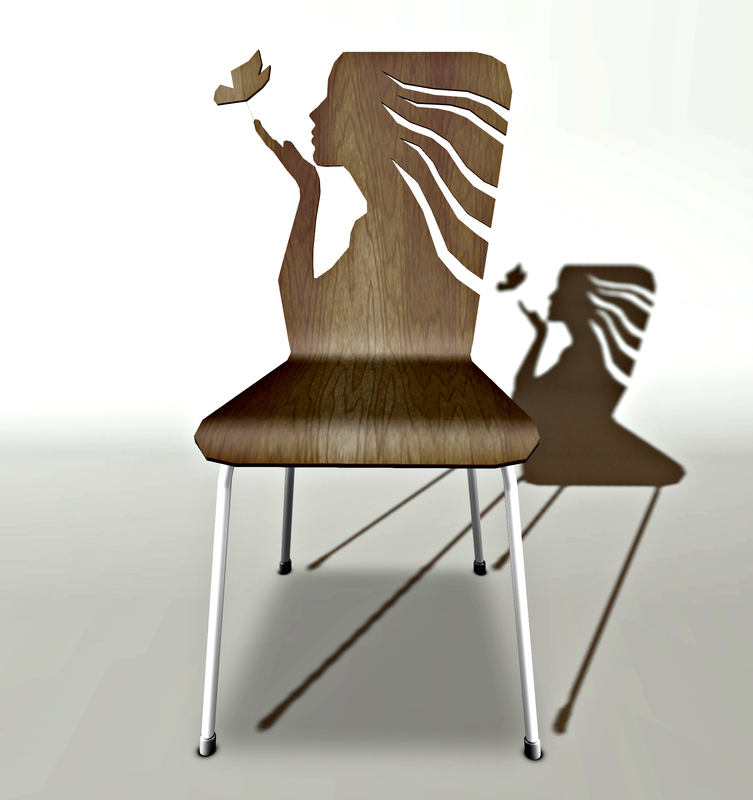 Chair number one features an elegant female silhouette, with the female figure gazing at a butterfly. Chair number two has a vibrant, modern motif that to my eyes is reminiscent of tribal tattoo designs, and chair number three appears to be the most traditional of the group, bearing a pattern that suggests a modern, rounded take on a Fleur De Lys theme. It’s a little Art Deco too, and out of the three I think this one is most suited to traditionally styled homes. Ria could have crafted these mesh marvels and fitted them with a bog-standard sitting animation and they would still have been leagues above their peers. Instead she’s gone the extra mile, and you’ll find that each one is stacked to the brim with animations, something that Ria is incredibly generous with in her builds. Not only do you have nine male and nine female animated sits in each, but there are eight couples poses and seven ‘misc’ poses too, and of course they’re all great fun. The misc poses include wearable props for all kinds of chair based activities such as knitting, embroidery, surfing the web, browsing a tablet, drinking coffee and reading a magazine. Every pose is perfectly realised and the props just add that extra touch of authenticity to proceedings. I had so much fun posing using these chairs, but they’re much more fun with a friend, so I enlisted the help of Jez so that we could test out the couples animations. It was at that point that I realised that while the singular poses are good, these chairs really come alive when couples use them together! You will create some lovely romantic scenes together with this furniture. The animation sequences feel very loving and proved really enjoyable to use as a couple. I played around with them, as you do, and to my joy I discovered that if I used the poses as a single, with Jez using the couples poses, we could create even more interesting scenarios. 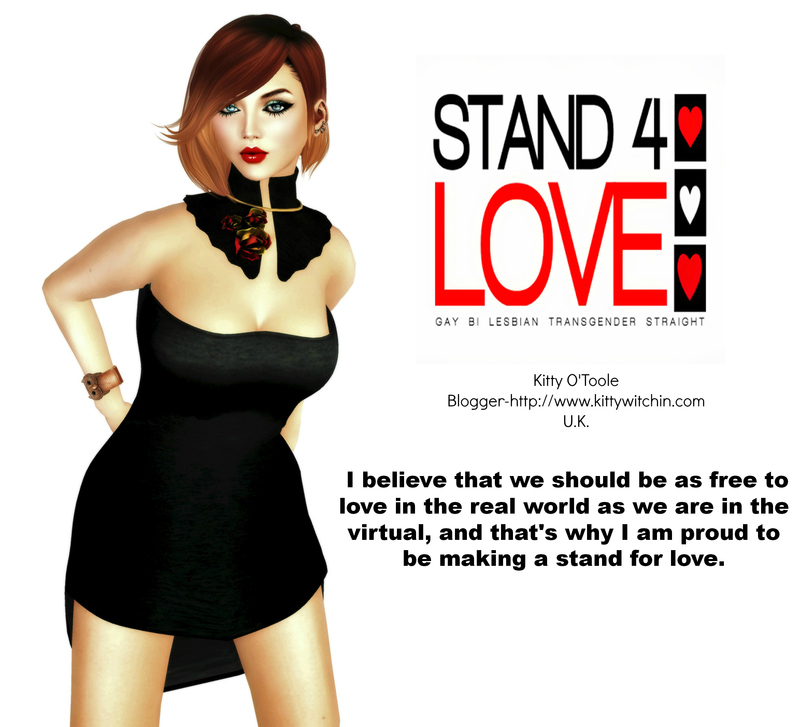 If you’re in any way interested in Second Life photography and modelling then these chairs should find a place in your home, without a doubt. And speaking of photographs, if you’re blessed with a strong enough graphics card the results will prove extraordinary if you use windlight settings heavy on shadows. Alas my graphics card isn’t *quite* good enough, but I did the best I could for the photos on show here, and I do hope I’ve done the chairs justice. What else can I tell you about them? Well, each chair comes in a variety of wooden textures (Brown, Dark, Light and White) and they will probably go on sale tomorrow (Friday 21st June) Unfortunately I don’t know how much they will cost, but I do know that they’re original mesh and I think they’re terribly exciting. I expect to see them featured in lots of blog posts in the near future, because I think they’ll really lend themselves well to interior design. 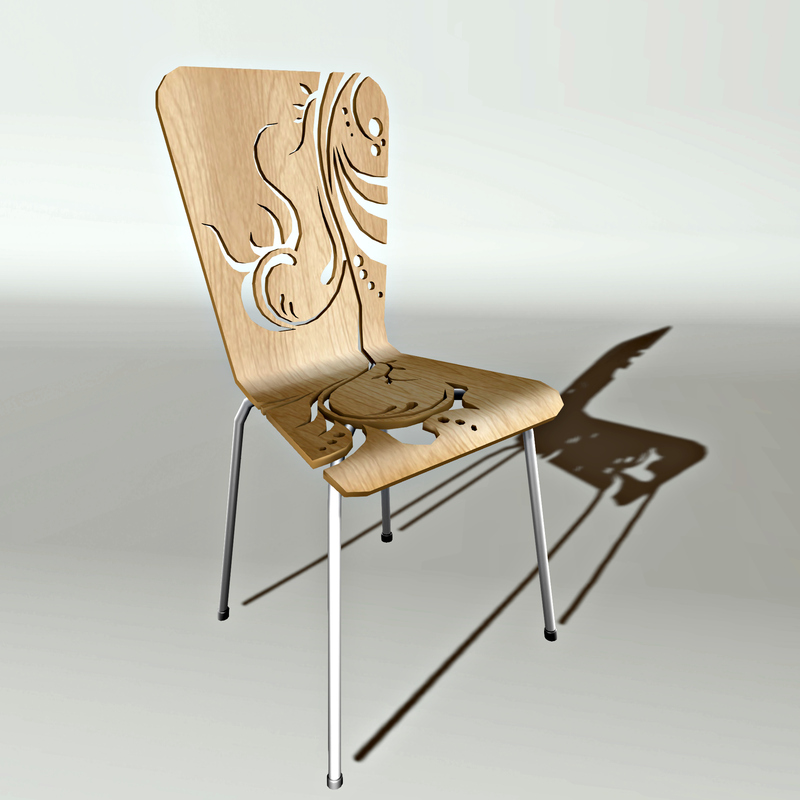 The Cutout Chairs are beautiful form with lots of extra fabulous function, and I think that regardless of price, they’re certainly going to prove to be a worthy investment for your virtual home. Click HERE to visit BAZAR.